* Discover the latest science and technology news. Each issue features general interest science news, articles, and current events on today's hot topics like technology, space, environment, health, and more. This magazine subscription will help you keep up with today's fast changing world. Can you afford to be left behind? Order today! * Use coupon code BF23688 to get the price! * Car and Driver 1-Year (48 Issues) or Motor Trend 4-Year (48 Issues) $10 after coupon. Magazine Sale: Wired or Bon Appetit Magazine $4/yr., Star Magazine $10/yr. * * Guitar World $6.99/yr. * * Family Handyman $6.99/yr. * * Conde Nast Traveler $4.50/yr. * This Old House is a home improvement magazine that primarily concentrates on the appreciation of quality craftsmanship and the pleasure that comes from exceptional design. Produced as a counterpart to its television show watched by millions, the magazine is written like a backstage pass to this extremely popular version of the title. * Use coupon code 54748O, The Oprah Magazine or Food & Wine Magazine. * * Bon Appetit for $4/yr. * * Taste of Home for $4/yr. * * US Weekly for $17.99/yr. * * People for $34.99/yr. DiscountMags Magazine Sale: Guitar Player $9/yr. or BackPacker $4/yr. Seize the deal before it’s gone. 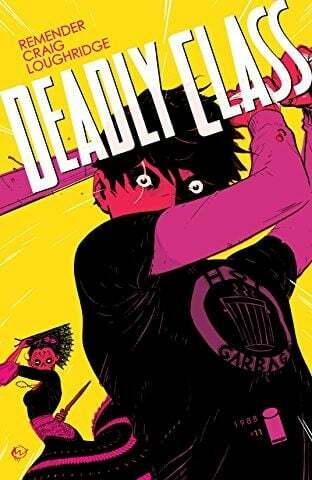 Check out Image Comics Deadly Class Graphic Novel Digital Editions Vol 1 - 6 - $1.20-$1.60 Each on Comixology at Comixology now. Find more discounts and offers from Comixology just at CouponAnnie in April 2019. * This boxed set includes the seven phenomenal Harry Potter hardcover books by best selling author J.K. Rowling. The books are housed in a collectible trunk-like box with sturdy handles and privacy lock. Bonus decorative stickers are included in each boxed set. * FREE SHIPPING.You may purchase up to 3-Years at this per-year price. * iOS 11 unleashed a whole range of powerful new tools for you to build intelligent apps, and this book helps you get started with them as quickly as possible: Core ML, Vision, ARKit, and more! / The goal of this course is to teach anyone how to build amazing iOS11 App from the ground up. You will learn the basics of iOS programming with playground demos and challenges. This will give you the solid foundation to start building iPhone Apps. Love a good bargain? To help you save more on Books, Couponannie strives to offer you the best Books deals 2019. On this Books deals page, you can easily narrow your search and get the best deals by category, store, brand and price. There's a nice picture of each product and key discount information, including the original price, sale price and price drop percentage that tell you whether this deal is worthwhile. Check it out to starting saving. To help you save and ease your shopping stress, here’s some of the best Books items you should focus on: Children's Books, E-Books, Literature & Fiction books, Textbooks, Art, Music & Photography, Biography & Memoirs, Business & Investing books, Computing & Internet books, History books, Mystery & Suspense books, Parenting & Families books, Political & Social Sciences books, and many more. Grab these Books deals and save as much as possible. Most importantly, bring it home at a cost you can afford when you use Books deals at your favorite stores, like LDSBookstore.com, Art Scroll, Half Price Books, Seagull Book And Tape, The David Allen Company, Daedalus Books and Music, Land Mark, FabJob.com, Schuler Books & Music, Collins Education, CARINA PRESS, Sourcebooks Inc., Chelsea Green, Fountain Bookstore, This is the Place, Blackwell Bookshop UK, Higginson Book Company, UTNE READER, RedWheel, and many more. If you shop online, make sure you read the return and exchange policies on retailers' sites. And to make sure you're getting a good Books deal, search Couponannie for a coupon code or promo code that will let you save some extra bucks. But exclusions may apply sometimes, and discount applies to selected products or categories. Read them carefully, too. We have checked prices at multiple retailers to make sure we give you the best price. So, remember to check out our site first before hunting for the best Books deals. Happy saving!